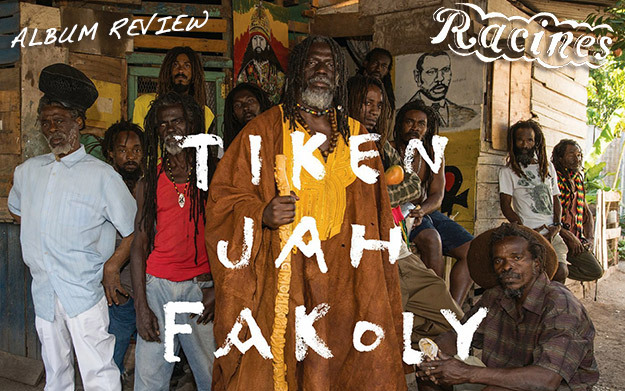 Ivorian reggae superstar Tiken Jah Fakoly presents his 9th studio album, but it’s not what you’d expect. Named Racines (French for “roots”), it takes Tiken back to the roots of the musical genre that he helps to define today and that defined him throughout his life. The eleven tracks it comes with are all remakes of all-time reggae classics. Tiken Jah flew to Kingston, where he recorded the songs together with Sly & Robbie, Robbie Lyn, and Mickey “Mao” Chung at the legendary Tuff Gong Studio. This dream team alone means you can expect much, but they did only half of the job. Tiken took the sound files back to Bamako, where an almost equally skilled team of renowned Malian musicians including Sidiki Diabaté added Mandé accents on ngoni, balafon, tama, kora, and violon sokou. Backing vocals were recorded in Paris. The resulting album celebrates some of reggae music’s finest milestones, staying largely true to the original version but adding new aspects to them. Not only did Tiken Jah Fakoly travel to Jamaica to discover the roots of the music he loves so much, he also brought that very sound back home to the Motherland, musically. The first track on Racines, Is It Because I’m Black, features Ken Boothe, whose version of Syl Johnson’s 1970 original turned it into a reggae classic. The mandatory Get Up, Stand Up comes with Daddy U-Roy DJing his comments. The mighty One Step Forward has Max Romeo himself supporting Tiken Jah. Slavery Days, as well as the other Burning Spear cover on this album, Christopher Columbus, underlines how important Tiken considers the historical links between West Africa and the Caribbean to be. Bob Marley’s Zimbabwe serves to illustrate Tiken Jah’s strong anti-colonialism and anti-imperialism. Jah9 joins Tiken on Junior Byles’ Fade Away, one of the most powerful songs on Racines. The only non-Jamaican or American song covered on it is Brigadier Sabary, the song Tiken Jah’s compatriot Alpha Blondy wrote in the 1980s against police brutality. Just like any other of the classics featured, it hasn’t lost any of its relevance over the years. Unfortunately. Less obvious is the remake of Buju Banton’s Hills And Valleys. Tiken’s version is as intense as the original, even though his voice is not as haunting as Buju’s. Junior Murvin’s Police And Thieves and Peter Tosh’s African round up the album. Tiken does on Racines what the fellow Ivorians of Magic System just did on Radio Afrika with African pop music: breathing new life into all-time classics. None of these big tunes needed to be revised, but all of them are so big adding a new edge to them couldn’t ever be wrong. Especially not if it is done with such love and care to detail as on Racines.